Protect your photovoltaic inverter against lightning. ALMA SOLAR, the leader in sales solar panels on the internet offers electrical boxes dedicated to photovoltaic installations. The norms in effect today requires you to protect yourself against natural elements. Order to answer this need, we have a wide range of electric box for photovoltaics. DC cabinets are equipped with MC4 connectors to facilitate the connection of your solar panels. Furthermore, to protect against lightning, you will find a surge arrester type 2 (dedicated to photovoltaics). The AC boxes are equipped with inter-differential delayed action. Indeed, it is important to delay the trigger because the current defects can be caused by the network and not a real danger. All our boxes are equipped sized isolator for voltages and current. We verify, when ordering, compliance of cabinet and we assure certification in force. Order safely your electrical protection. Electrical box (alternative current) for photovoltaic protection. Cabinet including wiring diagram. Required for each photovoltaic system. 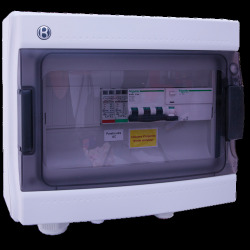 AC box 230 V AC single-phase up to 4 kW with differential circuit breaker 16 A - 30 mA + surge arrester type A. Electrical box (alternative current) for photovoltaic protection. Cabinet includes the wiring diagram. Required for each photovoltaic system. 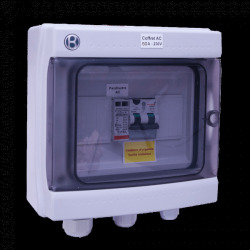 AC box 230 V AC single-phase up to 6 kW with differential circuit breaker 32 A - 30 mA + surge arrester type A. Electrical box (alternative current) for photovoltaic protection. Cabinet includes the wiring diagram. Required for each photovoltaic system. AC box 230 V AC single-phase up to 10 kW with differential circuit breaker 50 A - 30 mA + surge arrester type A. Electrical box (direct current) for photovoltaic protection. Cabinet includes wiring diagram. Required for each photovoltaic system. 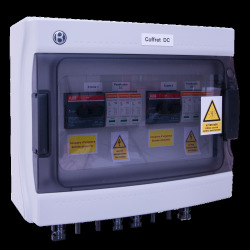 This DC box is needed for inverters with 2 independant entrances (2x MPPT). 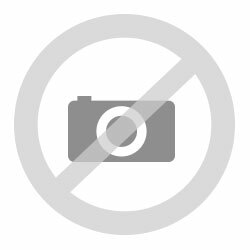 DC box 2 x MPPT - DC breaker 25 A - 1,000 V, surge protector type 2, 2 strings / MPPT - connexion with MC4. Electrical box (alternative current 3-phase) for photovoltaic protection. Cabinet includes the wiring diagram. Required for each photovoltaic system. AC box 400 V AC 3-phase AC up to 10 kW with differential circuit breaker 16 A - 30 mA + surge arrester type A. 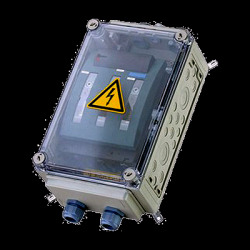 Electrical box (alternative current, triphase) for photovoltaic protection. Cabinet includes the wiring diagram. Required for each photovoltaic system. 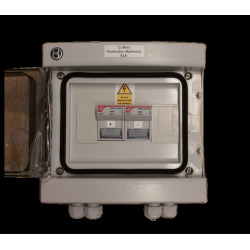 AC box 400 V AC 3-phase AC up to 20 kW with differential circuit breaker 32 A - 300 mA + surge arrester type A.
AC Box 20 A 400 VAC 3-phase AC 9-10 kW breaker 30 mA type A + surge arrester With alimentation for ENVOY and CPL repartitor on each phase. 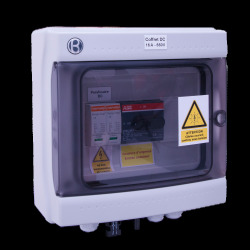 Electrical box (alternative current, 3-phase) for photovoltaic protection. Cabinet includes wiring diagram. Required for each photovoltaic system. 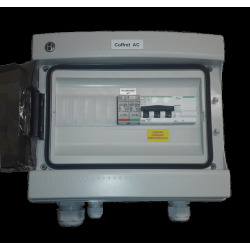 AC box 400 V AC 3-phase AC up to 36 kW with differential circuit breaker 63 A - 300 mA + surge arrester type A.